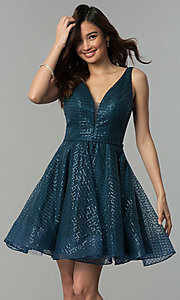 This short sequin-mesh homecoming dress is fun and sparkly. Adorned with sequins in a checkered pattern, this little semi-formal dress is a brilliant choice for school dances, parties, and more. Curving almost to the waist with a sheer-illusion panel for coverage, the v-neckline sets a flirty tone for the hoco party dress. Taking the design to another level, plunging cut outs at the sides are veiled with more mesh, and a wide v-cut along the fabric reveals the back. A tulle-lined a-line skirt angles over the hips to complete this sequin homecoming dress with flair. The model wearing peacock is 5'8" and wearing 4" heels.